The Augustana College campus holds many historic architectural treasures. One of its premier buildings is the Denkmann Memorial Library. In January of 1909, the seven children of the late Frederick Denkmann and his wife, Anna Bloedel Denkmann announced their gift of $100,000 to fund a library at the college as a memorial to their parents. Mr. Denkmann and his partner (and brother-in-law) Frederick Weyerhaeuser were Rock Island’s lumber barons – Mr. Denkmann was termed the “Timber King.” Both families were generous donors to local civic causes. The library announcement so thrilled Augustana students that they made an impromptu torchlight parade to the Denkmanns’ homes that evening and “demonstrated their gratitude with cheers and yells.” Three large Denkmann family estates were adjacent to each other on 26th Street between 5th and 7th Avenues, just a hop, skip, and jump from the Augustana campus. Mr. F. C. Denkmann lived at 625 26th Street, his sister, Apollonia (Mrs. Thomas B. Davis) lived next door at 605 26th Street and a second sister, Mrs. W. H. Marshall, just to north at 559 26th Street (6th Avenue, then as now, did not go through this block.) Miss Sue Denkmann lived with her brother, Edward in the old Denkmann family home at 122 4th Avenue. Two other sisters lived in New York and Fort Worth. The Denkmann’s former two block area was cleared in 1957, and now holds a grocery store and an apartment complex. However at least one of the Denkmann homes, Apollonia’s, was moved across the street to 6th Avenue and 27th Street and converted to apartments. Although it is now covered with siding and porches have been removed, recognizable architectural details remain, including beautiful iron roof cresting. With their gift, the Denkmann siblings also selected the library’s architects: Normand S. Patton and Grant C. Miller of Chicago. The Patton and Miller team was experienced in library design with over a hundred Carnegie libraries, most in the Midwest, under their belt. Jobst & Sons of Peoria, who built Rock Island’s Best Building downtown, received the contract to build the library. Although its style has been called Classical Revival and Italian Renaissance, now we recognize it as being heavily influenced by the Parisian Beaux Arts movement, which reached a height of popularity in the era, especially for public buildings. It combined many classically inspired elements in new ways. The walls of Missouri limestone have massive, 2-story round-topped window openings and there are decorative carved swags at the cornice level. The ornate cornice and rooftop balustrade gives an elegance that is typical of Beaux Arts. In contrast to the overall classical feeling, the intricate geometric carving above the main, 7th Avenue, entrance gives a hint of a different influence inside. Although no less elegant than the elaborate exterior, the interior is in sharp contrast. Here Prairie style details, restrained and geometric, have been incorporated. These are most apparent in the design of the stained glass dome and the metal stair railings. The grand marble stairs show gentle erosion from generations of climbing feet. Marble also lines the walls of the first floor lobby where there are marble tile floors as well. 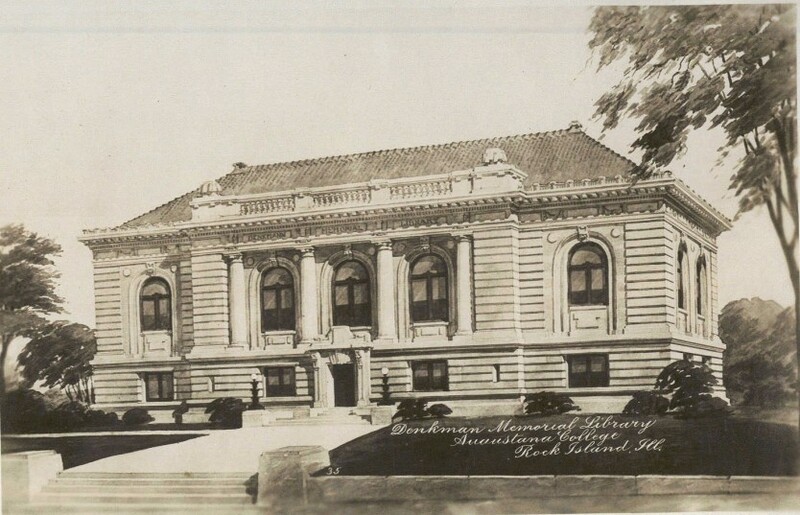 Optimists hoped that the new library would be ready for the 50th anniversary of the college in 1910, but its dedication did not occur until commencement week in 1911. The traditional activities that occurred over several days, from the religious baccalaureate services to graduation, were paused for the library dedication on May 31. Denkmann Memorial Library served as a repository for Augustana’s remarkable book, photography, and manuscript collections. In 1949, the rare and antique book collection of attorney Jesse Spencer, a son of a Rock Island founding family, was purchased by Augustana. In 1956, John Hauberg (Susanne Denkmann’s spouse) donated his books and papers, which include a wealth of local history, The Swenson collection of Swedish history in America is another important and unique collection. More books meant more space was needed. Denkmann heirs paid for additional excavation of the basement in 1940 and, in 1965, a large underground addition to the south was added. It was designed by Moline architects Lundeen and Toline so that it would have no impact on the exterior appearance of the library. More recently, after a much larger new library was built in 1990, Denkmann Memorial Library underwent renovation and restoration under the guidance of the architects William Appier and Leo Marolf. Reflecting its new uses – exhibit and performance space and an expanded Swenson Swedish research center – a new name was adopted for the rededication on October 20, 1991. It is now called Denkmann Memorial Hall. A full color booklet about the historic buildings, including many homes, associated with Augustana College is available free at City Hall or the Rock Island Public Library. It was published by the Rock Island Preservation Commission in 2003. Pick up a copy and enjoy an easy and informative self-guided stroll in the campus area. This article by Diane Oestreich is slightly modified from the original, which appeared in the Rock Island Argus and Moline Dispatch on August 2, 2004.